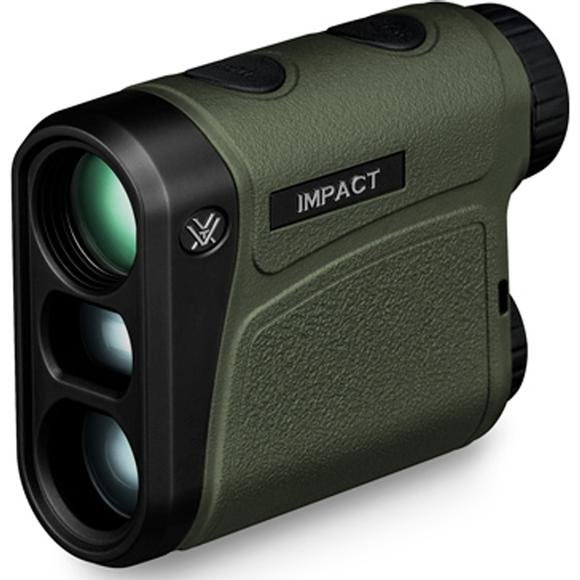 Simply put, with the high-performing Vortex Impact® 850 and its economical price tag, you don't have an excuse to head afield without a laser rangefinder. Accurately ranges reflective targets to 850 yards, providing critical distance readings hunters and shooters can rely on. Range targets down to 5 yards when things get up close and personal. Simply put, with the high-performing Vortex Impact® 850 and its economical price tag, you don&apos;t have an excuse to head afield without a laser rangefinder. Accurately ranges reflective targets to 850 yards, providing critical distance readings hunters and shooters can rely on. Range targets down to 5 yards when things get up close and personal. 6X magnification brings subjects in for a closer look and more accurate ranging. Fully multi-coated optics enhance light transmission for optimal performance in low-light settings. Provides angle-compensated HCD (Horizontal Component Distance) and LOS (Line of Sight) readings to match user preference. Can be set to read in yards or meters. The black LCD display boldly stands off against subjects during the moment of truth - and a fast readout ensures you get the range in time to capitalize on the opportunity. Runs on a single, long-lasting, easy-to-find, CR2 battery. O-ring seals prevent moisture, dust, and debris from getting inside for withstanding harsh weather conditions. Built to handle tough situations. Compact and lightweight. Easy-to-use menu with a simple, clean display. Choice of yards or meters. The Impact 850 uses HCD (Horizontal Component Distance) angle-compensated ranging technology to give bow and rifle shooters the critical distance data needed to make accurate shots. Line of Sight (LOS) mode displays actual line of sight range. This feature displays continual distance readings when panning across a landscape or tracking a moving animal. Range in yards or meters. Dimensions L: 3.77" x W: 2.95"